Qasr al Muwaiji (photo: Leigh-Ann Pow). 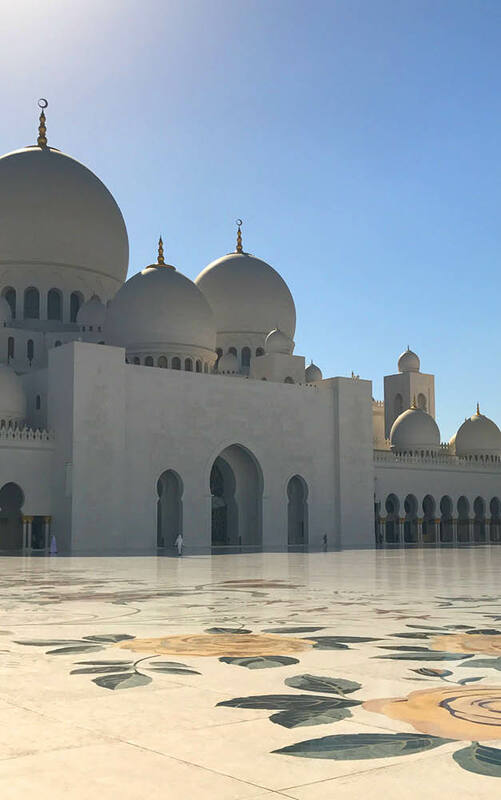 The sheikh Zayed Grand Mosque in the afternoon light (photo: Leigh-Ann Pow). Lunch in the oasis (photo: Leigh-Ann Pow). 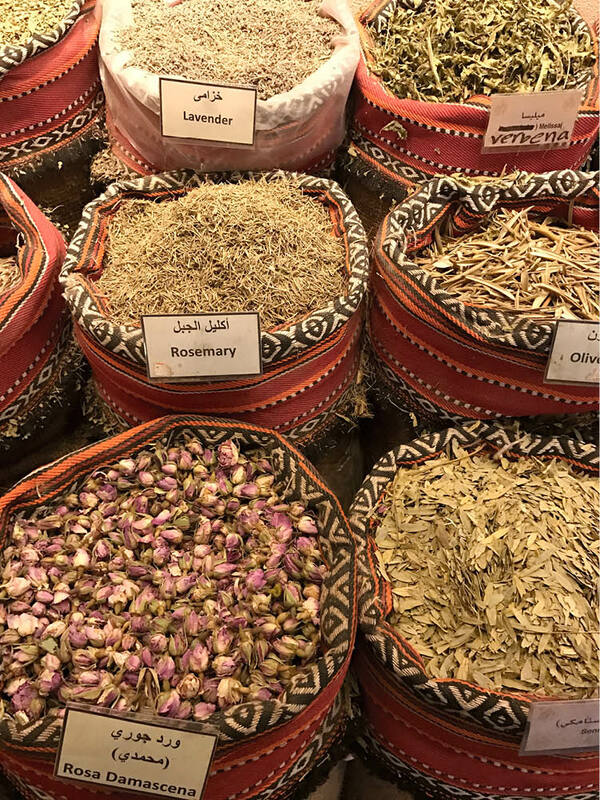 Spices at the the souq (photo: Leigh-Ann Pow). 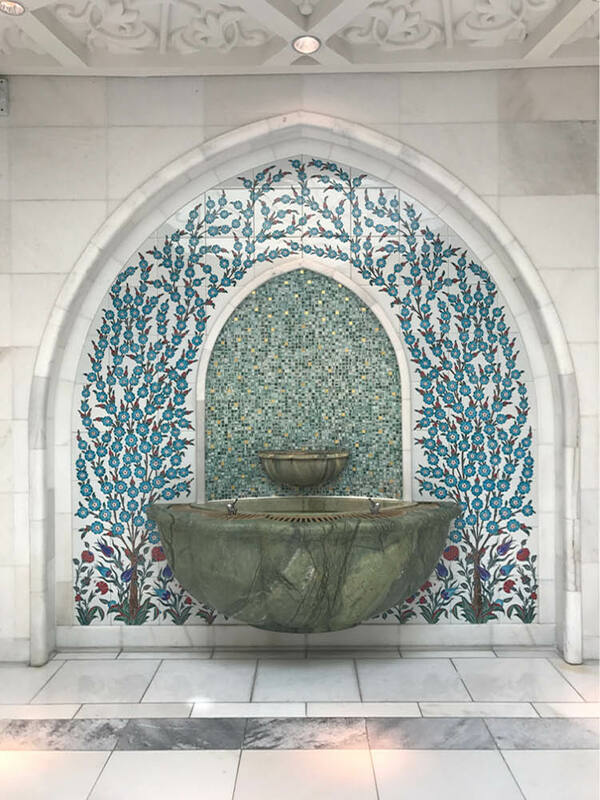 A drinking fountain inside the Grand Mosque (photo: Leigh-Ann Pow). 5.40am – My Etihad long-haul flight from Australia into Abu Dhabi arrives super early in the morning which means my day begins with a drive through the still slumbering city as the blazing desert sun rises; my driver takes me past the mammoth Sheikh Zayed Grand Mosque, its marble edifice taking on an ethereal golden glow in the morning light. 6.30am – Abu Dhabi is made up of a collection of islands, linked by a series of bridges; my accommodation is on an island 15 minutes’ speed boat ride from the city. Zaya Nurai Island is a tropical paradise, with lush gardens and a laid-back barefoot luxe aesthetic: my beach-front room is kitted out in white-washed wood and a cool blue palette. There’s a gigantic marble bathroom drenched in sunshine from a skylight above the rain shower and a plunge pool on my patio. 8am – The sun is scorching even at this early hour so I take a golf buggy to breakfast rather than ride the blue and white bike parked outside my door. I sit looking out to the Arabian Sea as I develop an instant obsession with creamy labneh, hummus and baba ganoush on warm flat bread. 10.15am – My guide Georgette meets me off the speed boat; originally from Malta, she knows absolutely everything there is to know about her adopted home. As we drive out of the fast-developing luxury and arts enclave of Saadiyat Island, I glimpse the stunning Jean Nouvel-designed Louvre Abu Dhabi, its latticed metal and glass roof made to resemble the shadows cast by the interlocking fronds of the date palms that are everywhere. It will eventually be filled with works of art on permanent loan from the Louvre in Paris; a Guggenheim Museum designed by Frank Gehry is next on the agenda. 10.45am – We head to the Al Mina markets, where locals come and go buying fresh produce, spices and dates, a prized commodity here. Along ‘date alley’ the dried fruits are stacked high on plates or packed tightly into boxes; at least 45 varieties of dates are sold here including plump medjool dates, the gold standard. With Ramadan a week away, the markets are buzzing with people stocking up on gifts to take when they visit friends and family to break their fast each day. 12pm – We drive to the Emirates Palace, once the most expensive hotel ever built, until Marina Bay Sands stole its thunder, but it is still opulent on a level hard to describe; silk, brocade and gilding abound. There’s a strict hierarchy to rooms, with a floor for exclusive use by royalty, one for heads of state, and one for celebrities. The property has a staff of around 2000 and measures one kilometre across; the general manager admits to sometimes getting lost in its labyrinthine wings. At lunch I feast on the signature camel burger with gold-dusted chips – the meat is dense and gamey – and finish with a gold-dusted cappuccino, of course. 4pm – After riding across town among luxury cars and behemoth Land Cruiser and Pajero 4WDs (Emiratis don’t pay income tax, and petrol in this oil-rich country is cheap), I am delivered to the sublime Sheikh Zayed Grand Mosque, named for the revered former ruler of the country, the father of modern Abu Dhabi. Visitors are required to cover up before entering: for women, heads, shoulders and ankles; men, legs and shoulders. I’ve come prepared with an abaya, the long, flowing black smock that Emirati women wear over their clothes (and vertiginous heels) when out and about, and a shayla scarf, but they can be borrowed here too. The beauty of this sprawling complex is instantly evident, from the swathes of pearly white marble to the gorgeous Islamic tiling. Inside the prayer hall, the carpet underfoot is the biggest in the world, an exuberant riot of colour and pattern (it took artisans in Iran a year and a half to make). Overhead is a series of colourful crystal chandeliers that resemble inverted date palms, while the walls and domes are decorated with inlays, carvings and tiling. I notice a duo of digital clocks, one with the current date, the other listing the year as 1438; this is set to the Hijra calendar, which started in AD622 with Muhammad’s migration to Medina. 7pm – I head back to Zaya Narai Island and explore the island after dark, including Smokin’ Pineapple beach bar, with its pineapple-shaped pizza oven and laid-back vibe that’s popular with the ex-pats who flock here on weekends. 9.30am – The oasis city of Al Ain, a two-hour drive through undulating desert, complete with camels strolling the side of the highway, is a perfect day trip from Abu Dhabi. One of the world’s oldest permanently inhabited settlements, the oasis is a fascinating proposition of verdant palm groves and traditional architecture. Driving into town we pass building works for the new Sheikh Khalifa Bin Zayed Grand Mosque, dedicated to the current ruler; its giant dome visible above the hoardings, inset with a verse from the Quran in gold. 11.30am – At the Souq Al Qattara, Bedouin women sit crossed-legged on the floor, their faces decorated with the traditional thin metal and indigo-dyed fabric burqa, selling bags of spices and baskets woven from palm fronds. Nearby, stalls are laden with all manner of salted dried fish, along with produce made plump and ripe by endless sunshine. 12pm – A short drive away is the hulking Al Jahili Fort, the UAE’s most historic building, erected between 1891 and 1898 by Sheikh Zayed the First to defend the city and its precious palm groves. Within the soaring fortified walls, constructed from mud and sand, an expansive courtyard leads to a series of circular towers and a visitor centre that houses a permanent exhibition of photography by English explorer Wilfred Thesiger, the first person to bring a camera here in the 1940s to document the lives of the still largely nomadic people before oil was discovered in 1958. 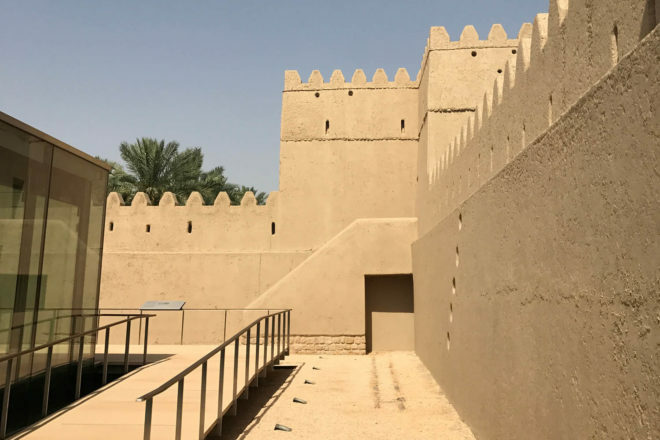 1.00pm – The nearby Qasr al Muwaiji, the birthplace of Sheikh Khalifa, makes for fascinating viewing: for all intents and purposes it is a palace, but it is rendered in humble, almost domestic, proportions. A sleek modern glass box of a visitor centre, inserted as part of the restoration process, houses a potted history of the ruling Al Nahyan family. Outside in the parking lot a silver food truck sells burgers to locals, who sit and feast in the shade of the date palms. 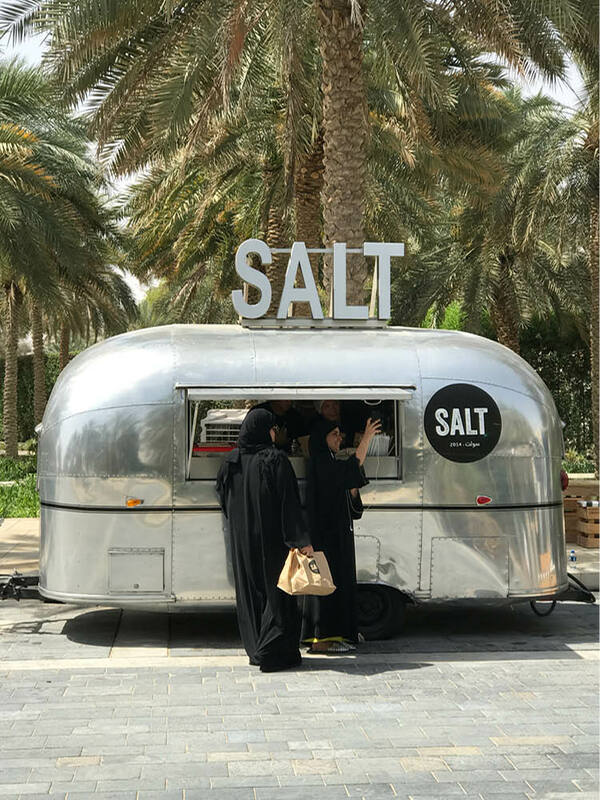 2.00pm – Lunch for me is a feast of traditional Emirati dishes at the wonderfully atmospheric Al Fanar, its dining room presented as a traditional Emirati residential courtyard from the 1960s. Dishes arrive laden with subtly spiced chicken and rice (machboos deyay), and slow-cooked meat (thareed laham). We finish with lequimat, little doughnut balls drenched in date syrup and fresh mint tea. 5.00pm – After returning through the lilting desert landscape, I am deposited at the grand Eastern Mangroves Hotel & Spa by Anantara for a traditional hamman treatment involving a precise routine of steaming, sauna, and then a vigorous scrub and soaping on a marble slab, finished with a gentle massage. 7.00pm – With an early check-out the next morning I return to my plunge pool at Zaya Nurai Island and find it hard not to regret that I don’t have another two days to spend in this compelling, fascinating place.